Esprit: The quality of being lively and vivacious. This word captures the very essence of life, providing a sense of hope that is crucial for all those who feel trapped in the throes of a mental illness. Esprit Fest is an event set to celebrate the incredible warriors who battle in any capacity with a mental illness. This festival was created to be a reminder of all the beauty and spirit that life has to offer. With a slate of incredible bands, musicians, speakers, and vendors, it’s going to be a day of inspiration, hope, and spirit. Hosted at the always incredible venue, Game Baltimore, Esprit Fest is going to be a mental health event unlike any other. Evan Nachimson is a singer, songwriter and artist community builder hailing from Reisterstown, MD now residing in Brooklyn, NY. Evan is known as a supportive figure and leader in the post-folk, alt-singer/songwriter movement in Brooklyn. He sees music as a way to emotionally validate his listeners, and offers his audience a deeper connection with themselves and the people in their lives. Vulnerability and its power are ever-present in his music and live performance. Since their formation in 2012,Young Poet has gone through a lot of changes. The initial lineup, genre, even the name has changed, a metamorphosis that would have dissolved any weaker brotherhood. That perseverance is now their album, "Thrive In A Modern Era. Hello! We are From Blue, To Greene. 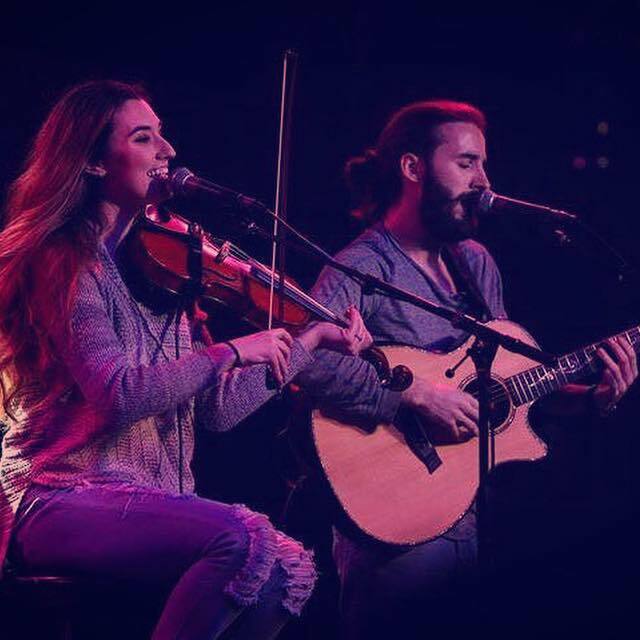 A New Jersey based band comprised of members Kaela Fanelli & Austin Vuolo. We are an acoustic duo with a wide variety of instrumentations in combination with a positive mindset ready to change the world with our music. Alyssa is a recent graduate of Northeastern University and will be attending University of Illinois at Chicago College of Medicine in the fall. She has been battling depression for 6 years and is a fierce and proud mental health advocate. She aspires to be a physician that will provide a sense of comfort and vitality on a daily basis. Alyssa looks forward to the opportunity to make a difference in the best way that she knows how, through a deep passion for science and an even deeper love of helping others. Hello! My name is Taylor Stern, I am 21 years old, and I am from Owings Mills, Maryland! I am studying Fashion Merchandising and Management at Philadelphia University, graduating in May of 2018. I was active throughout elementary, middle, and high school playing basketball and softball. Coming to college was a wake-up call for me, making me go through and handle things I never thought I would have to. Fitness and being “skinny” took over my mind, leading me down a really scary road. I have been recovering for almost a year now. Thankfully, Nourish Family Nutrition was, and still is, a great outlook for my journey. I am currently working at Athleta which is an athleisure wear brand. Their mission is to make girls and women feel beautiful and confident in their own skin. Without even knowing it, they have been a huge part of my recovery, making me feel worthy and perfect just the way I am! Always “live in the moment”, a saying very close to my heart. Mallory Gothelf is a writer, speaker, and passionate mental health advocate. Deciding to put purpose to her illness, she has taken to stepping out of the shadows of her disease, and into the proverbial light, to bring a face of hope to those still in the throes of this battle. My name is Imani Cauthen-Robinson and for the past 12 years I have struggled with mental illnesses. Up until this most recent year, I have let my diagnosis get in the way of being happy, my relationships, and my ability to live a healthy life. I have always been one to keep all of my emotions and feelings to myself, but I later realized that holding it in only makes the pain worse and the recovery harder to achieve. So I started a blog, InhaleExhale, where I could be open, vulnerable, and honest about how I felt and my daily struggle with living with various mental illnesses. I have encouraged others to share their stories on my blog as well and I have received overwhelming support. My mission is to break the stigma against mental health and empower and encourage people to use their voices to make a difference. Handmade in small batches, BuddhaBites provide sustained energy from a slower burning balance of whole grain carbs, healthy fats and protein that are meant to provide nourishment; morning, noon and night, before or after athletic endeavors, when a pick-me-up is needed between meals or just for a nutritious snack. BuddhaBites are available in four delicious flavors: Naked, Chocolate Chip, Cranberry Walnut and Almond Butter Chocolate Chip. Whatever flavor you select, BuddhaBites are perfect for an energy boost or to curb cravings. Sheppard Pratt Health System (SPHS) is the largest non-profit provider of mental health, substance use, special education, and social support services in the country. As a nationwide resource, SPHS provides 2.3 million services each year across a comprehensive continuum of care, spanning both hospital- and community-based services. Since its founding in 1853, SPHS has been an innovator in the fields of research and best practice implementation, with a focus on improving the quality of mental health care on a global level. SPHS has been consistently ranked as a top national psychiatric hospital by U.S. News & World Report for the past 27 years. The American Foundation for Suicide Prevention (AFSP) is the leading national non-profit organization dedicated to suicide prevention. AFSP’s mission is to save lives and bring hope to those affected by suicide, investing $22million a year in research, education, advocacy, and support to those affected by suicide. With a bold goal of reducing the annual suicide rate in the U.S. 20% by 2025, AFSP is focusing on designing programs, supporting policies, and sharing interventions. AFSP is ranked as a top non-profit with the highest ratings from the Better Business Bureau and the National Health Council and puts an emphasis on making a meaningful impact with over 84% of all contributions being invested back into program services to further the fight to #stopsuicide. Over the past 4 years, RPV has paid out over $2,400,000 to patients and caregivers. RPV gives Patients and Caregivers an opportunity to Voice their opinions through surveys and interviews questions to help improve the services and products. NAMI Metropolitan Baltimore improves the lives of individuals living with mental health conditions, their families and communities through education, support, and advocacy. Nourish helps the Baltimore community find and maintain optimal wellbeing through nutrition. Our expertly crafted dietary programs and counseling is tailored to further enhance the individual’s health and lifestyle. Eileen Thiessen has a passion for helping others achieve their health and wellness goals, including physical, mental, emotional, or financial wellness. As an ambassador with Plexus Worldwide, she helps people to prioritize their health goals and figure out how to best achieve them via supplementation with natural products and developing healthy habits with eating, becoming more active, stress management, and making healthier choices in general.